WLTW’s Nina Del Rio host of “Get Connected” interviews partner Robert Kornitzer on the topic of Fathers’ Rights. WLTW’s Nina Del Rio host of “Get Connected” interviews Tadd Yearing on the topic of Grandparents Rights. Partner Robert Kornitzer is quoted in an interview with WaynePatch. 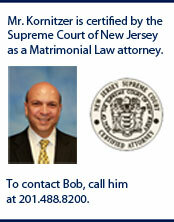 com in regards to his new certification as a matrimonial law attorney.